New golf products hit the shelves every single year. These days many golf gadgets are tech-oriented: GPS watches, sensors, launch monitors; others are old standards that have been in use for decades. We can all agree, however, that the very best golf gifts share three important attributes: They’re easy to use, they deliver a result … and they elicit a smile. What’s the best golf gift on the market in 2017? The IMPACT IMPROVER! Every golfer on your list, from your teen to your boss, will love it. Golfers of all levels need to work on consistent ball striking by making contact in the center of the clubface. The IMPACT IMPROVER® allows you to swing whenever and wherever you want while providing immediate ball strike feedback. The IMPACT IMPROVER is incredibly simple to use – just attach the Strike Shield to one of your iron clubs (PW-5iron)*, then take a swing at the specially designed Impact Ball. At impact, the ball sticks to the clubface and instantly tells you where contact was made. With each rep, you’ll know exactly how you’re hitting the ball and if you should make a change. The IMPACT IMPROVER lets you practice indoors which is a huge time saver. It improves your body awareness. It allows you to practice your swing minus curious onlookers on the driving range. Plus, the IMPACT IMPROVER is portable! It’s so small and lightweight, you can toss it into a large pocket, a backpack or a briefcase. If you’re on the go, the cool durable zipper case makes it easy to keep in your golf bag or tuck it into a corner of your suitcase for your next trip. 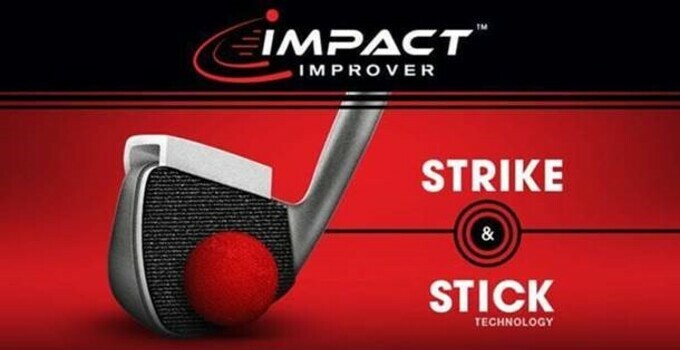 Remember, the IMPACT IMPROVER is ideal for players at all levels. New golfers can work on their swing before venturing out in public. Experienced golfers will have the perfect tool for drills whenever they have time for some practice. The strike shield fits both adult and junior right-handed clubs (a left-handed isn’t available yet). It’s truly the perfect gift for dads, grads, moms, friends, clients and colleagues. If you want your golf gift to stand out and provide the recipient with a tool they haven’t seen before and that they’ll use every day, the IMPACT IMPROVER is the way to go! And when they strike the IMPACT IMPROVER in the sweet-spot, it will be sure to elicit a smile.